In this topsy-turvy Premier League season, in which everything impossible has become possible, Leicester City sit in second place, while titleholders Chelsea and the generally consistent Swansea City linger perilously close to the relegation zone. Amidst all the irregularities, Arsenal have emerged as convincing title contenders and currently top the table by a 2-point margin over they’re nearest competitor. The North London club’s win percentage in 2015 was the highest calendar year total in the club’s history and in contrast to some of their rivals, this allows Arsenal, with a settled squad and manager, to hit the ground running coming into the New Year. This article will work through the external and internal circumstances that have played a part in presenting this golden opportunity for ‘The Gunners’ to potentially win their first Premier League title since 2004. Ranieri’s men have been nothing short of outstanding this season. It seemed that ‘The Foxes’ primary objective would be to remain in the top flight… however; they have given their fans a lot more incentive to higher aspirations. Their team values are built around hard work and shock tactics. Leicester have successfully defeated opponents utilizing this strategy and, as a result, their confidence has increased week-in-week-out. The shared belief of the club has escalated to the point, where they expect victory no matter who is put in front of them. Despite everything falling into place for Leicester so far this campaign, it will be difficult to maintain this intensity and stay in top gear for a full season. I’m not saying they are going to drastically fall down the table, a top 4 finish is definitely theirs to lose, but with some tricky fixtures on the horizon, it seems likely that points will be dropped sooner rather than later. Their trademark hunger and ‘in-your-face’ attitude has been fantastic; nevertheless, their success might just be their biggest downfall. Opponents are beginning to show them more respect and ‘The Foxes’ have now failed to score in their last 3 Premier League matches. You’ll have a hard time sifting through a sports paper, at the minute, without a headline along the lines of, ‘Boring Man Utd’, ‘Toothless Man Utd’ or ‘Player unrest at Old Trafford’. It’s clear to see that their fans have been left disgruntled following several mediocre performances this season and their disconnection with Louis Van Gaal has grown. The Dutchman has actually managed to fashion together a decent points-tally this season, nevertheless, it is the monotonous style of play, in which the Dutchman is extremely stubborn and persistent with that frustrates the majority of the clubs supporters. With the uncertainty surrounding the management and with the likes of Juan Mata and Wayne Rooney, who are usually their most dependable characters, failing to perform in Van Gaal’s restricted possession system – I cannot see them putting together a realistic title push. Manchester City are the most capable side of pushing Arsenal all the way, however, they have slipped up on more than one occasion this season and comments regarding their manager’s future are beginning to be thrown around. Just like their Manchester neighbours, rumours of Pep Guardiola making his way to England have confused matters further. The Manchester clubs have some harsh months ahead of them – both on and off the field. Will we see the first League Title in the Ashburton era? Credit: Steve Curati under License. Where to start with the German Maestro? Arsène Wenger stated that the World Cup winner “is like a musician who always plays the right notes at the right moment.” This is a perfect description that portrays Özil’s intelligence. Since stepping foot in England, there has always been and still is, unnecessary criticism that lingers around the 27-year-old. This may be a result of Özil’s languid playing style, everything he does seems to be performed with ease, which in turn has manufactured a ‘lazy Özil’ stereotype; which ironically is a lazy route taken by pundits and journalists from around the country. I recently heard David Moyes say, “the jury’s still out on him”, but I’m not even going to delve into that immature comment, from someone who has obviously taken a break from watching the Premiership this season! As Özil is not the type of player to be seen running about the field left right and centre (similar to Alexis Sanchez) critics identify him as an easy target and use it as an excuse of weakness. When in a matter of fact, Özil is just very efficient in his movement and is aware of his teammates; he moves away, he comes back, he tempts defenders out of position and then pulls them back into the position he wants. Many turn a blind eye to this, as he is not drenched with sweat, bent over gasping for breath, but all in all the way he creates space for the team, as well as himself, is fantastic and the only way to fully appreciate this is by watching individual highlights. Former player and now coach at the club, Martin Keown recently said, “the way Arsenal attack and play football is their success – that’s their brand, attacking football. Özil is key to that.” I completely agree. Özil, with 16 assists, has Thierry Henry’s record of 20 in a single season firmly in his sights. If Arsenal are to put together a serious title push then Mesut Özil will need to continue with this strong mindset; blocking out the flack and continuing with his, as Steven Gerrard put it, “frightening and scary”statistics. It is not a coincidence that Arsenal’s recent form emerged shortly after Aaron Ramsey’s reappearance from injury. The Welshman’s return to the squad and notably his return to the centre of midfield has rejuvenated the London club. Deployed in the box-to-box role, he offers a more direct approach to Cazorla. Ramsey drives his team forward, which was highlighted with Arsenal’s second goal vs. Aston Villa on the 19th of December – winning the ball in his own half, continuing his run forward, before finishing the move, he started, with a clinical finish inside the opposition’s box. 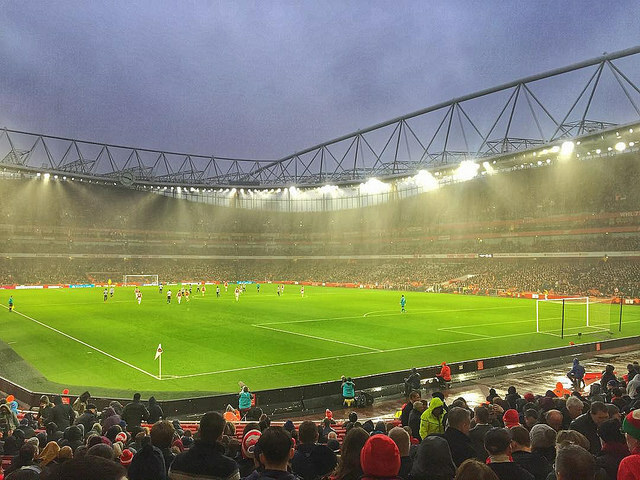 Written by #ABW Guest Blogger, @NaturalFootyFan – go give him a follow! Have you listened to the latest #ABW Podcast, Episode 135: Hello 2016? How about the Radio Show from post-Sunderland? Go give them a listen! This entry was posted in NewsNow, The Bergy Blog and tagged AFC, Arsenal, Arsene Wenger, Gunners, Manchester City, Manchester Utd, Mesut Özil, Olivier Giroud, Premier League, THeo Walcott, Walcott, Wenger. Bookmark the permalink.